2015 has seen a lot of great movies get released both in theaters and on VOD. Sadly, The Surface is not one of them. This is surprising because on paper it is a story that should, in the very least, be interesting. Two strangers (played by Sean Astin and Chris Mulkey) find themselves stranded in the middle of Lake Michigan with nothing but each other for company. As the movie progresses we find out about each of their struggles and what brought them to where they are now. In theory, that should be a fascinating character study. Except it’s not, it ends up a trying ordeal for both the characters and the audience as they endure an almost two hours of pointless bickering and needless exposition. Astin, who usually a great actor but has been slumming it in the VOD and faith-based arenas lately, seems to be phoning in his entire performance. Sometimes you can get away with that but not when your character’s defining feature is that he’s suicidal. 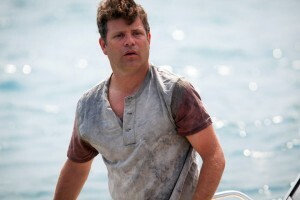 Sean Astin in The Surface. One gets the feeling the film started out as a short but when they got Astin on board they realized they could get enough budget to turn it into a full-fledged feature. The only problem is they didn’t both to expand on the script any so we’re left with almost 20 minutes of padding at the beginning of the movie where we watch the step-by-step process of Astin brushing his teeth, parking his car, putting his boat on to the water, etc. You can feel the director making every effort to eat up time before the plot eventually kicks in around the half-hour mark. This movie is desperately trying to be Alfred Hitchcock’s Lifeboat but doesn’t seem to get that the audience actually has to care about the characters in order to root for their survival. Almost an hour into the movie, right about the time Mulkey asked Astin what his sign was and if he was a cesarean birth or a natural birth I lost all sympathy for everyone in the movie. Usually a script is edited over and over again until only the meat and potatoes of the story remains and the characters can get on with the driving force of the story. None of that seems to have happened here. It’s as if they took the first or second draft of the script and just decided to shoot that not realizing that what was put on screen wasn’t remotely engaging. The Surface is available today on DVD and On Demand.